Over 70 per cent of the broccoli grown in Ontario is Paragon; Cruiser and Premium Crop are also popular varieties. Broccoli is an excellent source of Vitamin C and folacin, and a source of fibre, Vitamin A and potassium. Broccoli was grown mainly in Italy since the Roman Empire until the 16th century when a royal marriage brought the vegetable to France. We have the union of Catherine de Medici (a daughter of the powerful Florentine banking family) to Henry II of France to thank for introducing broccoli to French gardeners and cooks. Cultivation of the vegetable spread throughout Europe and was first grown on this side of the Atlantic in Virginia in the late 1700s. Today, broccoli is enjoyed through much of the world, in creamed soups, nouvelle cuisine vegetable purées, crisp Italian sautés, salads, Chinese stir-frys, as well as steamed and tossed with butter and lemon or paired with hollandaise sauce. At its peak, broccoli is tightly budded with bright grey-green leaves and yellow-green stems. Any with buds bursting into flower or yellow florets are past their prime. Look for bunches with slender stems. Heavy stems are often woody. Broccoli will keep for up to five days in a perforated bag in the refrigerator crisper. Wash, drain and remove outer leaves; cut and trim the stems. Cook just to the point of becoming tender. Steaming segments or florets takes 8 to 15 minutes; check to make sure you aren't overcooking. 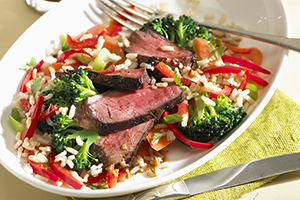 Stir-frying cooks a little more quickly, so it's important to check for tenderness as you cook. To microwave, place in a microwave-safe baking dish with 1/2 cup of water; arrange with florets toward centre of dish. Cover with plastic wrap and cook at high (rotating the dish at half-time) for 8 to 10 minutes or until stem ends are tender. Let stand, covered, 2 to 3 minutes before serving. As well as a staple of the raw vegetable platter, broccoli can be cut up small and incorporated into a vegetable pasta sauce, or even as the base of a flavourful purée or soufflé. Broccoli is delicious sautéed with olive oil and garlic, then tossed with chopped walnuts or freshly grated nutmeg and black pepper. 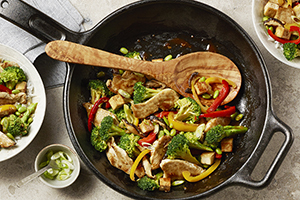 And it's superb stir-fried with other vegetables, meats and hoisin sauce, soy sauce or sesame oil.